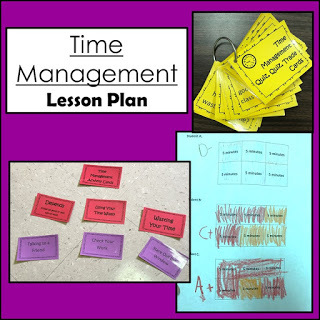 A repeat request from both my 3rd and 4th grade teachers is a lesson on time management. There’s a lot of different ways that this can go, but I focus on time spent in school…with a heavy emphasis on independent work time. This is the plan. Ask the kiddos what it means if someone says “Use your time wisely”. 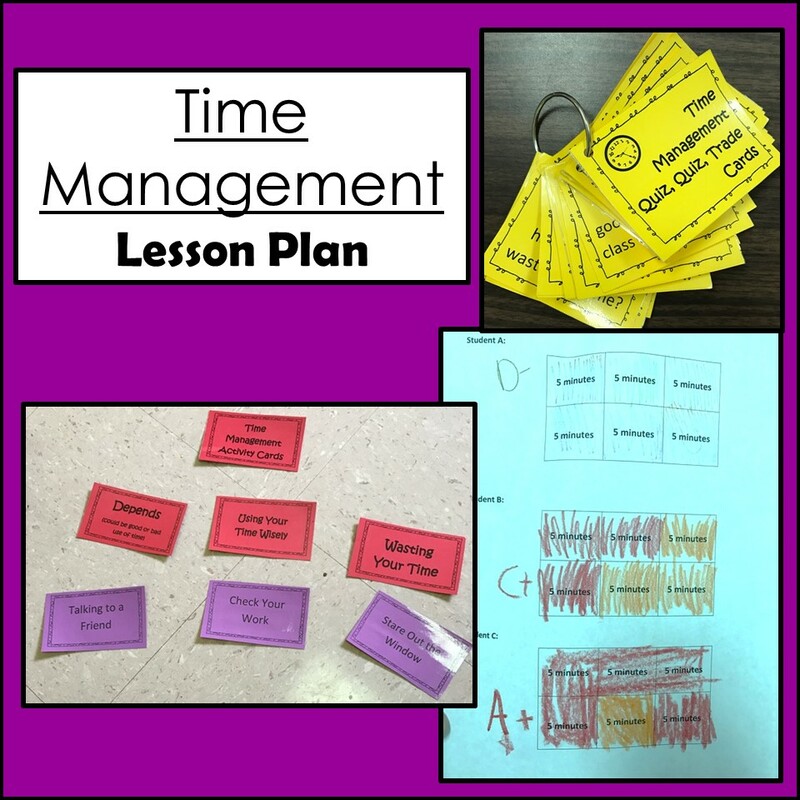 Have students sort these activity cards, in small groups, into these categories: Using Your Time Wisely, Wasting Your Time, Depends. Discuss the ones groups have disagreements on or that I see lots of kiddos getting wrong. Tell the students a “story” with students as examples (they love this). I essentially read scripts about how three different students spend their time, while student volunteers color in the time as it passes as a visual reminder. 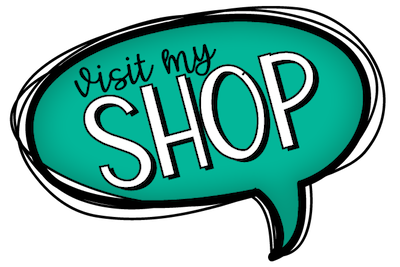 After each student’s story, I ask “How did this student choose how to spend their time” (Student A – whatever was fun and not boring, Student B – whatever was easy and not hard, Student C – whatever it took to do the job with their best effort). 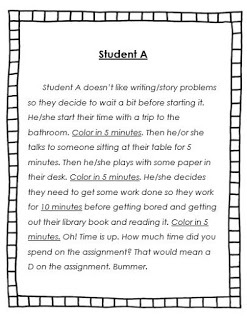 Sometimes I ask the students to tell me what grade they hypothesize each student would get on the assignment because I think this helps them to see the outcomes/consequences of time management. 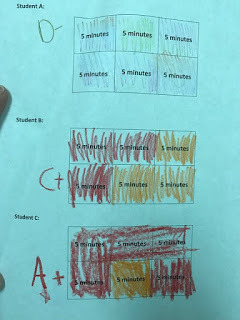 Depending on the students in the room however, I sometimes leave it out because I recognize that some of our students can use their time wisely and give their best effort and still get a lower grade. 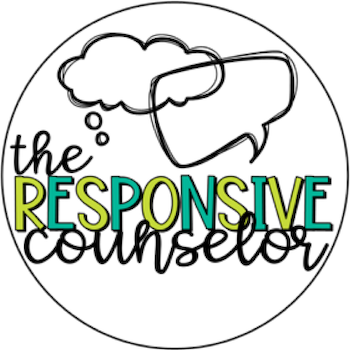 For some classes, we finish the lesson with the students completing a self-reflection worksheet about specific activities they need to spend more and less time on at home and at school. 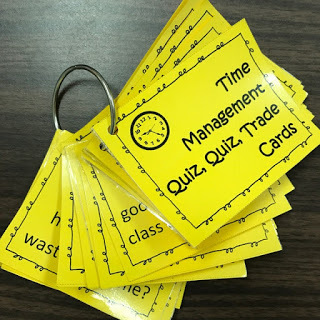 For some classes, we do “Quiz, Quiz, Trade” using time management discussion questions. I usually give each student a card, then ask them to stand up and find a partner. They each take a turn reading their question aloud and letting their partner answer. Then they switch cards and go find new partners. “Quiz, quiz, trade!” You can have them continue like this for as much time as you have – I usually do 10 to 15 minutes. At the beginning of the year, the first time we do QQT, I do A LOT of modeling (how to find a partner/”hand up, pair up”, voice volume, turn taking, etc.). 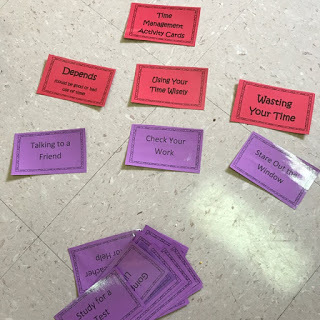 For some of my classes, they need more structure and so I use a chime to indicate when it’s time to switch cards and find a new partner (this is also helpful when you have kiddos that are too verbose or that are rushing). In groups that can’t handle even that, I place the students in two concentric circles facing one another. I have them take turns asking their questions (eg. inside partner then outside partner), swapping cards, then one of the circles rotates clockwise one spot. It still allows for movement and chatting, but in a more controlled way if needed. 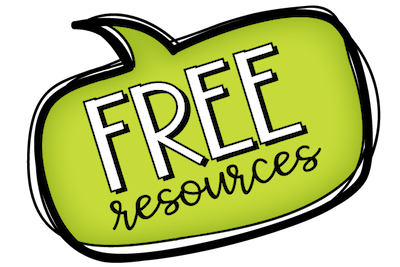 This lesson is one of the smoothest – the students remain incredibly engaged throughout and the pacing feels spot on. That’s always a win in my book!